Continuing on from "Angels of Darkness, Demons of Light I", this follow-up is much the same as the first in this series so if you didn't like that album, perhaps you should stop here. For this second part, the core of Dylan Carlson and Adrienne Davies are reunited with Karl Blau on bass and Lori Goldston on cello. 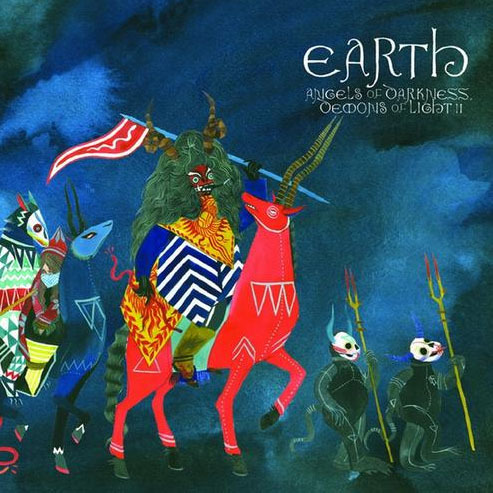 I have the feeling this'll be the last we'll see of Blau and Goldston with Earth as Carlson has reportedly expressed interest in English and Scottish folk music so future Earth albums may have a more folk-oriented influence. "Angels of Darkness … II" begins slowly and lazily with barebones, almost abstract dapples of guitar tone painting the general universe in which the album will play out. It's a restful, slow-burn yet dark sonic landscape that's being depicted here: laconic and minimal in expression yet straightforward in its aims. We start getting our teeth into Earth music proper with "His Teeth did Brightly Shine" with a stark and quiet melody, spidery and slightly ringing in tone, against a sombre background of space. The emotion is intense and concentrated and I imagine the musicians themselves did feel that way. As for what the title could mean, Carlson and company leave that to you to figure out: could be the leader of a pack of coyotes, all desperate for food, and finding a lone man, dying of thirst perhaps, crawling across the parched desert ground. Could also be a gun-man, crazed from the heat, about to shoot his horse for meat. "A Multiplicity of Doors" brings in Davies's sparing and hushed percussion and Goldston's sharp and lonesome cello which adds a slightly smoky feel and wandering counterpoint to Carlson's guitar. The conversation engages your attention and though the style of music is as minimal as ever, there's also a soundtrack feel here: just the kind of music you'd think of for a desert Western movie based perhaps on a Cormac MacCarthy novel. The track builds up but ever so slowly; listeners can't afford to have attention deficit disorder to appreciate what Earth are doing here. It's very hypnotic and the cello and guitar weave together in a drunken dance, a kind of a slow waltz through an ambient fug and various blues keys. The atmosphere feels so hot and dry! As the track progresses, the band's sound becomes fuller in spite of the repetition … or perhaps that's just my mind embellishing the music for me. We pass through "The Corascene Dog" which frankly sounds like fussy filler to "The Rakehell" which features moody, soulful bass and a retro-1970s vibe in its general sound. Generally Carlson's guitar and Davies's drums concentrate on cranking out the rhythm while Blau's bass plays around the edges of the structure. Again this is a slow track and listeners are forced to concentrate on the details such as guitar texture - it does get a little rough around its edges - and the way the guitar and bass exchange lead roles throughout while Davies provides the backbone. In some ways this is quite demanding music to listen to in spite of its apparent simplicity and minimal approach: Earth just gives you the bare essentials in the music, atmosphere and track titles and on this foundation, you absorb the sounds, rhythms and melodies and your imagination supplies the movie. The music sounds lazy and low-key but let it draw you in and you may be surprised at the level of intensity and the darkness here. There are no great changes from "Angels of Darkness …I" here and Earth could be accused of coasting along in a niche that the band has been digging for several years now. That might change in the future. Not my rip, not my scan-job. Thx very much to the original uploader! 5% WinRar Recovery Record for all files. Try before you might buy. Support the artists you like and buy their stuff whenever you can afford it.